Ichijou can't take the tension any longer. 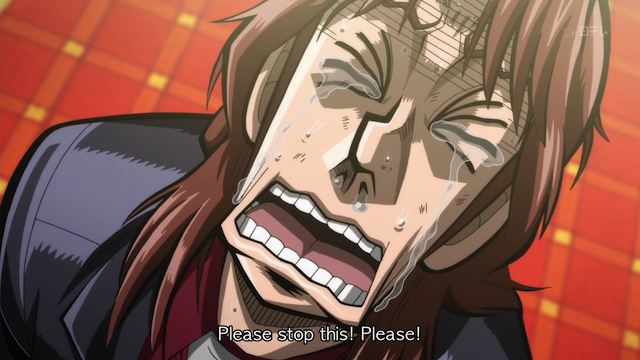 Kaiji season 2, episode 25 shows what appears to be the end of the Bog arc. Next week will presumably be an epilogue, although, the way Kaiji works, I wouldn’t be surprised if there was one more twist. In truth I think they could have sped up the Bog arc somewhere along the way. It is too early to give my final impression, but this last half was not as brilliant as the first, and that might have been avoidable by speeding up the pace. Individual episodes often were full of tension, and several episodes flipped back and forth rapidly in my expectations of who was winning, but the length of the Bog arc kept individual plot twists from seeming like substantial progress. To be honest the last twist of this season was one of the very few I’ve actually seen coming in this series because everything always ends up happening in a different (and more awesome/down-to-earth) way than I expect it to. Not in this case however! Sry, I don’t have a good way to move it for you. If you do, copy this over I’ll respond in detail under the new post.